Aloha! Sorry for the lapse in posts - I was site seeing in Maui for the past week. It was fabulous! 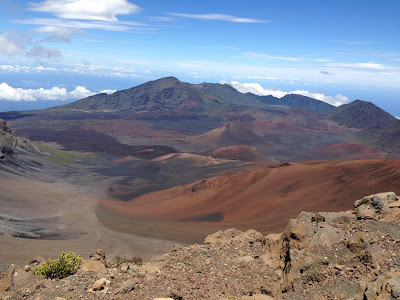 The picture above is from Haleakala Crater - at 10,000 feet elevation, high above the clouds on the Island. Surprisingly, I didn't have as much time to make jewelry on vacation as I expected. I imagined I would have nothing but time to relax on the beach or at the pool with beads and wire - finding shells on the beach to wrap, etc. Nope - none of that! Instead it was snorkeling, hiking, zip lining, banana boating, paddle boarding, eating and drinking. And no shells!! I've never been to such a beautiful beach that has no shells! Lots of coral and lava though. But, I did manage to do some beading on the plane on the way home. I didn't want to attempt to carry on my tools, so I figured this was a good time for me to try my hand at more Miguel Ases style beading. I have made a few more practice items, but this is my first complete pair of earrings since the first ones I made for a swap last year. Since I didn't have scissors, the big challenge was how to cut the fireline thread for each of the components. Any guesses how I did it? No, my teeth are not that sharp! I used the sharp edge of the soda can opening. It still took considerable effort, but it worked. I learned a lot making these earrings (besides that you can cut thread with a soda can)... 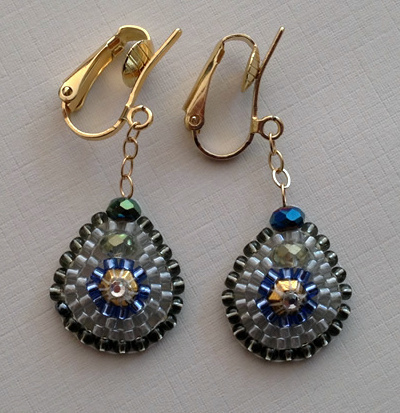 If you are interested in making this type of brick stitch earrings, here are my tips. Tip 1: Plan out how many beads you would like to surround your focal bead. You are probably thinking how the heck do I know until I do it? Yup - that's the point. But you do need to know in order to space them evenly and get your thread tension correct. Otherwise you'll end up with tight beads at the beginning and loose or crammed ones at the end. 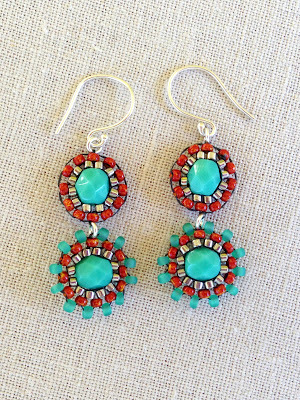 And it will be very difficult to make your earrings match. To plan how many I needed, I typically only had to bead 1/4 of the way around the bead. Tip 2: This may change as I get more experience, but I suspect it is easier if you start with the smaller beads and switch to larger beads as you move to subsequent rounds. I'm sure that's not a rule, since I've seen plenty of earrings where it wasn't the case, but for these earrings, it worked. Tip 3: Try to plan how you will attach your components before you make your last round. It will save you a lot of time figuring it out later. These earrings took me as long to make the components as it did to add the jump rings and finish the ends. Had I planned it out in advance, I definitely would have saved time. Tip 4: Make sure you leave a long enough thread tail at the start of your project to weave it into the project and tie it off correctly. Yes - I was struggling with pieces of thread that were barely long enough to sew through with the needle attached. 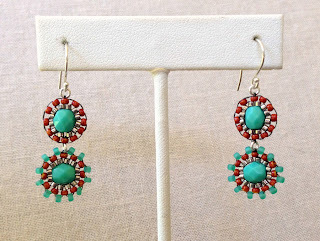 I'll end this post with the first pair of Ases style earrings that I made. I still think they are pretty good, but following my tips, I think I could make a pair that has a better shape with more balanced bead spacing. I still like the shape of this design too, so I will give it another try some time soon.